Today I present to you a man who is funny enough for a year’s worth of Funny Fridays, and whose talent could fill up Musical Mondays until the Dandy Revolution. 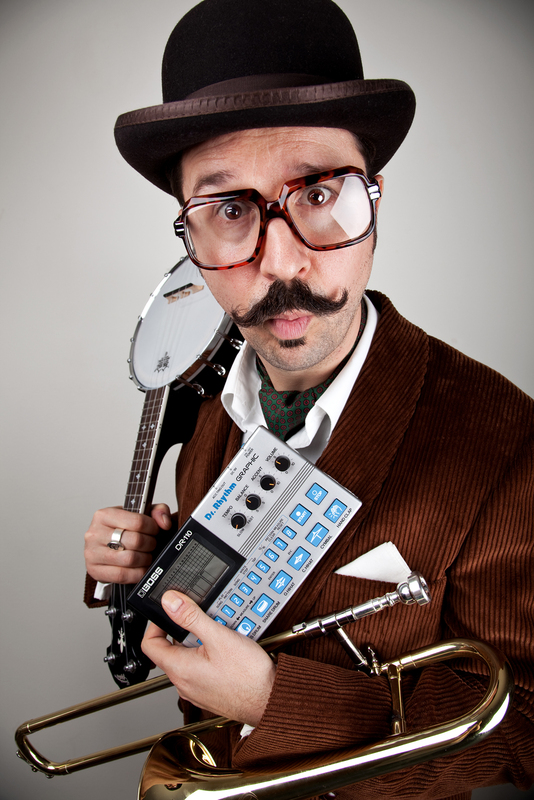 The one and only, Mr B the Gentleman Rhymer. Mr B (Jim Burke is his real name) is the inventor of Chap Hop, a genre which is really the only thing happening in hip hop at the moment. He takes the basic premise of hip hop and improves it by adding the Queen’s English, tweed and a banjolele. He also wanders around with a soprano trombone because, well, why wouldn’t you if it were an option? I’ve loved Mr B’s music since I first saw the video to Chap Hop History (his take on the timeline of Hip Hop) about two years ago. I have all his albums, including I Say!, OG Original Gentleman, and The Tweed Album, which came out just a few weeks back. I even almost crashed my car because of Mr B! I was driving through Bracknell listening to I Say (rapping along to a song about Guy Debord in my best Received Pronunciation) when I glanced in my rearview mirror and saw his unmistakeable moustache and glasses combo in the Yaris behind me. I turned up the volume and started to wave at him with the windows down, but he rather sensibly avoided the raging fan boy putting people’s lives at risk. I want to share with you his music, because it is insanely good. Every bit of banjo or trombone you hear is Mr B, he does all the mixes, everything himself, including some mega-multitrack vocals. It’s pretty hard to find stuff that I can share with you from the latest Tweed Album, but if you like it enough please do take a punt on iTunes. The songs “Nympholepsy” and “Amusing Apocalypse” are worth the £7.99 alone!